Sometimes we dream and we wonder if God has caused these dreams. 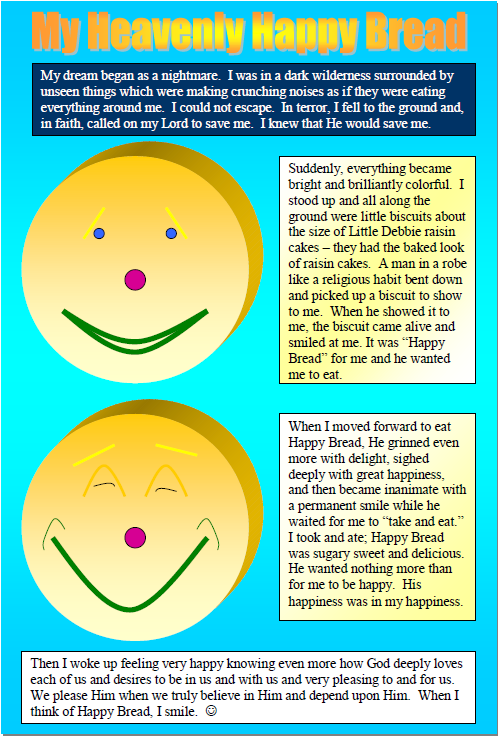 The dream I have posted in the graphic above was one which I had and which brought me great comfort while I was in a city where I felt threatened by dark “forces.” The dream reassured me that the Lord, fully present in the Holy Eucharist, was there for me. I attended the Holy Sacrifice of the Mass and received the Lord daily in the Holy Eucharist of His Presence. He comforted me. He comforts you, too, if you believe in Him, in His power to heal and love and protect and save you from evil and degeneration. But to those who, with killing fangs, unrepentently snear and ridicule and growl at Him and at his sheep, do not expect this kind of help. You are the one that Jesus protects us from. Jesus and His Mother Mary love us and they come, and are coming now to keep us safe from you. The Lord, Jesus Christ takes on the obedient flesh of Mary and He lives to do the Will of the Father. His love is to obey the Father, to do His Will. Christ doesn’t present just any flesh to the Father; he presents the most immaculate of humanity to the Father – that which He received through Mary.